My sister came to visit and in traditional Adelaide weather it was a weekend of high thirties days and hot nights.. not very nice! This week was a sister pick and we thought we would enjoy the day with some seafood. This recipe had it all, easy to make, healthy, tasty and so quick! There was more to this recipe, but due to the weather we felt we did not need he fennel and couscous sides. Sorry for the lack of photos, I was too excited about eating I forgot to take a "finished" shot. 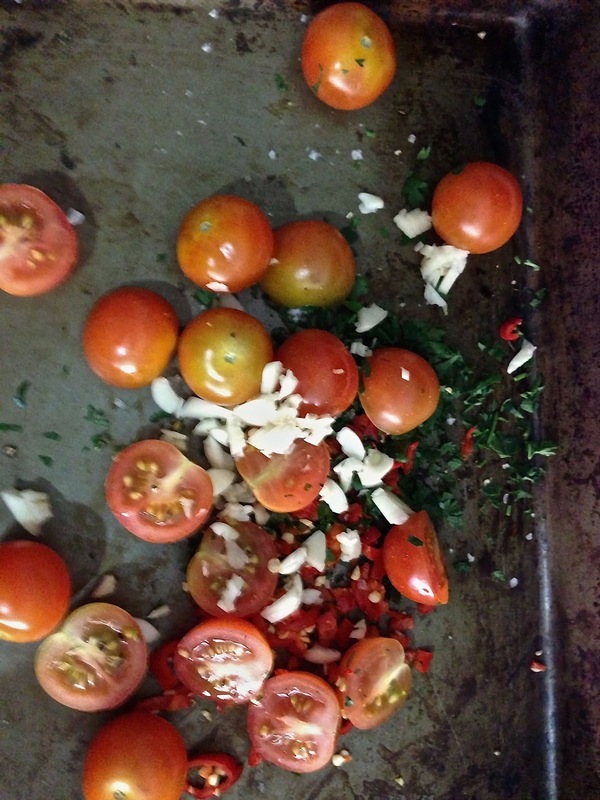 Roughly chop the parsley leaves and chilli and out into a large high sided roasting tray with the tomatoes. Squash in the unpeeled garlic through a garlic crusher and mix with 1 tablespoon of oil, salt, pepper, and the juice of half a lemon. Half the fish fillets, then add to the tray with the shellfish (throw away any mussels or clams that wont close when tapped), and toss together. 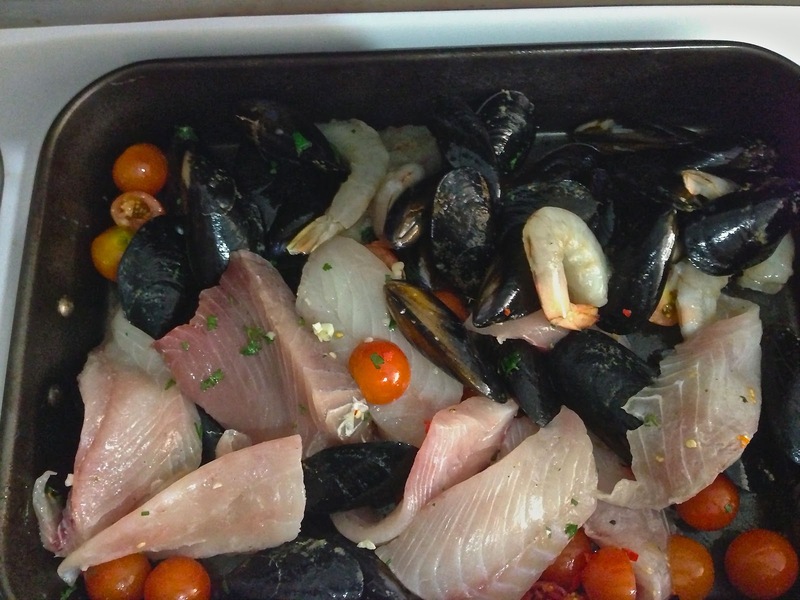 Cook in the oven for 10 minutes or until the clams and mussels have opened (throw away any that remain closed). Changes Made: More prawns, as we love them! Not much else changed as its such a simple and easy one. Results: Delish! Loved the addition of the cherry tomatoes as they just pop in your mouth with sweet goodness. This was so easy, although it all ended up a little salty from the mussels opening (I assume that was why) and tasted a little sea watery. Next Time: Maybe cook the mussels separate, and turn the oven up more!! First photo does not show and I want to know what is the "Base of Champions". Made my mouth water! Base of champions = cherry tomatoes, garlic, chilli, parsley and seasoning!